The Murray River is an ancient river, even by the time scale of geologists. It's origins date back about 130 million years ago. At this time much of Australia was submerged under a shallow sea, so that on the map it would have appeared as a group of islands rather than in its present shape. In that time the whole land mass started to rise out of the sea (about 100+ million years ago). Salt water flowed away from the emerging land, back into the ocean and a river was born which would eventually become the present-day Murray. The major geological events affecting the character of the developing river were the formation of the Great Dividing Range of mountains and two enormous sedimentary basins - the Murray Basin and to the north, and the Great Artesian Basin. 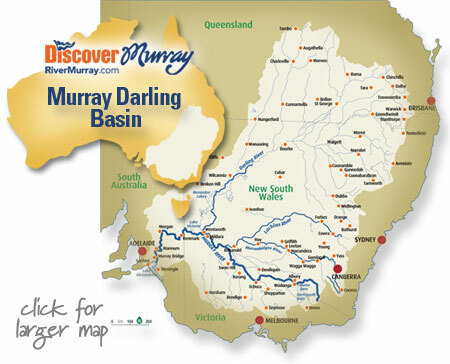 The Murray-Darling Basin is about 250,000 square kilometres and is bounded by the Great Dividing Range to the east, and the Mount Lofty Ranges to the west. In the north it's separated from the Great Artesian Basin by an impermeable division. Today the area of the Murray-Darling Basin consists largely of flat plains country in which Quaternary and Tertiary sediments rest on a hard impervious basement of rocks - predominantly of the Paleozoic Age (about 250 million years old). A major feature which occurred during this long evolution was a great incursion of the sea during the Tertiary period. The seas flowed in, over what is now the south eastern coast of South Australia and at the time of maximum inflow created the Murravian Gulf reaching as far inland as present day Balranald and Swan Hill. As conditions on earth changed over the long 100 million-year development of the Murray-Darling Basin so did the geological and biological processes, and it is all there, recorded in the layers of the sediments–limestone from marine organisms, brown coal from ages of lush plant growth, silts carried down from the mountains by the river to form the great flat sea of search that is now the Hay-Balranald plain. As the sea commenced its great retreat, it left behind in the sediments and in the soil enormous quantities of salt, particularly in the Mallee region of north-west Victoria and the adjacent part of South Australia. Today that same salt is a major problem due to clearing, irrigation and improper management. While the slow subsidence of the floor of the Murray-Darling Basin was taking place, an outcropping of rock was pushing up around the margins of the basin to form the surrounding highlands. Even within the basin all was not completely quiescent, and in recent geological times faults have occurred. The most significant of these is the Cadell Tilt Block between Echuca in Victoria and Deniliquin in New South Wales which is one of the most spectacular examples in the world of faulting altering the course of a river. Along the fault line which lay squarely across the path of the River Murray a massive block reared up at a faster rate than the river could cut down through it. Finally, about thirty thousand years ago the flow in the Murray west of the fault was blocked off altogether and the river was diverted north and south to find paths around the giant obstruction. Another movement forced the river to cut completely new channels for itself. In the more westerly section of the Murray-Darling Basin another uplift, the Pinnaroo Block–profoundly affected the character of the river by damming it off to form a giant fresh-water lake called Lake Bungunnia. The Lake extended from near the site proposed for the Chowilla Dam, close to the South Australian-Victorian border, back as far as Robinvale in Victoria. Later, the Pinnaroo Block Dam was breached by a stream flowing on the seaward side of the Block which had cut back into it until a channel had formed - releasing the water of Lake Bungunnia once again to flow out to the sea. So the river in South Australia became rejuvenated, flowing in a narrow valley, cutting down sharply to form many miles of the beautifully golden calcareous cliffs which are a feature of the Murray in that state.